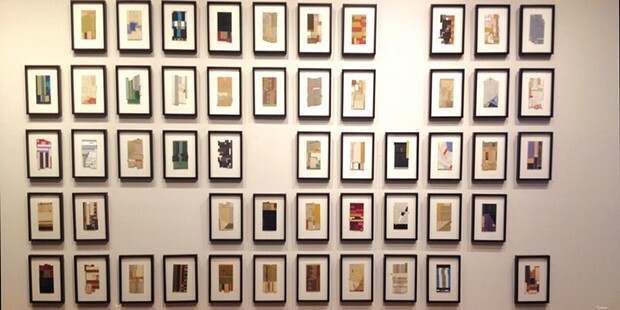 Holve's "The 1-52," framed collages of disassembled books. An early work of language art by Jenny Holzer reads: "With all the holes in you already there's no reason to define the outside environment as alien." Sebastopol-based artist Brooke Holve's show, Cuts Make You, about sliced and broken surfaces, brought that phrase to mind. The exhibition's name sounds like a joke about collage but Holve says it's intended as a statement about "the way creative praxis shapes the voice in which it's expressed." The things you shape shape you. 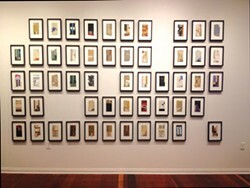 Holve trained as a bookbinder and her wall-mounted assemblages offer an impressive display of possibilities in book arts. Multi-faceted constructions feature stacked and pleated paper, tape and canvas. Their appearance is the product of many precise, consecutive cuts and folds. They are as crisply articulated as a starched shirt. Many of these works take the shapes of information structures. Their labyrinthine surfaces recall the shape of an archive, or a brain. In fact, every aspect of their densely pleated surfaces has been made out of a preexisting book. Holve availed herself of a deep reservoir of unwanted books otherwise destined for landfill — mostly older library editions acquired in bulk from thrift shops or via donation — and mined for material. Scanning the faceted surfaces of her assemblages is like scanning spines in the library stacks, if the library stacks had been exploded and radically rejiggered. The older binding materials Holve uses have a visible grain and a distinctive look. They come in a range of earth tones that look sober and restrained in comparison to contemporary bindings. These are obviously sturdy materials intended to last more than a couple of years, which in itself dates them. The most spatially involved structures are minimally colored, and vice versa. One sharp-edged field of discontinuous quadrilateral panels is executed only in library binding tape, no two segments of which are precisely the same shade of dusty black. "Text is an important element in all these works," Holve said, "even though that might not be immediately apparent." Most assemblages do feature a word or number, often in some discreet place. While most of the books harmed in the making of these artworks have been rendered anonymous through Holve's cuts, occasional bits of book get preserved because of the messages they convey. Identical little logo tags read "Fly Buys." ISBN codes tattoo the surfaces of a dark and otherwise laconic five-part series of wall constructions. It looks like a row of archival storage boxes made strange in a library technician's fever dream. There are jokes here, too. The text fragment |Behind the silken curtain| appears in a wall assemblage that features, you guessed it, translucent silken layers juxtaposed with paper folds. 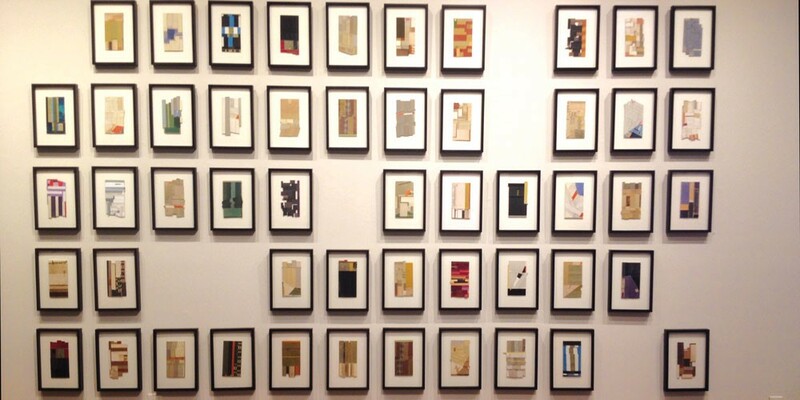 The largest series here arranges identically scaled and framed collages in an incomplete grid. Each collage features a single printed word: the definite article "the." Holve said: "I wanted to call attention to the difference between the sense of uniqueness or specialness that the definite article confers, versus the less remarkable existence-as-group-member that the indefinite article 'a' denotes." Holve's materials reinforce her project's retro aspect. When e-books and the Kindle first became available, some forecasted the actual book's imminent demise. That extinction has not taken place as predicted. But while physical books are in no danger of disappearance, they are understood to represent an older order. The fact that Holve works with books published in earlier generations exaggerates this retro effect. She's parsing information structures of the past. However, unlike many artists who work with older technologies, Holve says, "I'm not interested in nostalgia," and indeed the cool, impeccable surfaces of her creations would not support such an interpretation. These artworks may be retrospective, but they are not backward-looking. They show how the incisive patterns characteristic of 20th-century thought got subsumed in new techniques of information access, organization and storage. Let's not forget: Cutting itself is retro. It meant a lot to modernists. It could be a swashbuckling way for a member of the avant-garde to savage the picture plane, all the while reaffirming its centrality. It is the signature action for collage — from Hannah Hoch's Dada masterpiece "Cut With the Kitchen Knife" to the late cut-paper works of Henri Matisse, to the Beat texts cut up by William Burroughs to Lucio Fontana's slashed canvases, to Yoko Ono's "Cut Piece" performance. "To cut" makes the top 20 of Richard Serra's 1968 "Verb List" for sculpture. Holve knows these precedents, but said that none of them have been especially important as sources of direct influence. She turns instead to poetry, mentioning Theodore Rothke's poem "Cuttings" as a source of inspiration that has shaped her process. Conversation with Holve calls up the notion of the modern eye as a distanced cutting tool, reinforced against compassion fatigue. The tendency for modernist artists to blend cutting with seeing was epitomized in the famous scene in which an eyeball is sliced by a razor in Un Chien Andalou (An Andalusian Dog), Salvador Dalí and Luis Buñuel's surreal shocker of a movie, which broke Parisian attendance records in 1929. Dalí and Buñuel wanted art to upset rather than reinforce prevailing ways of ordering things and ideas. Slicing was their generation's "disruption." 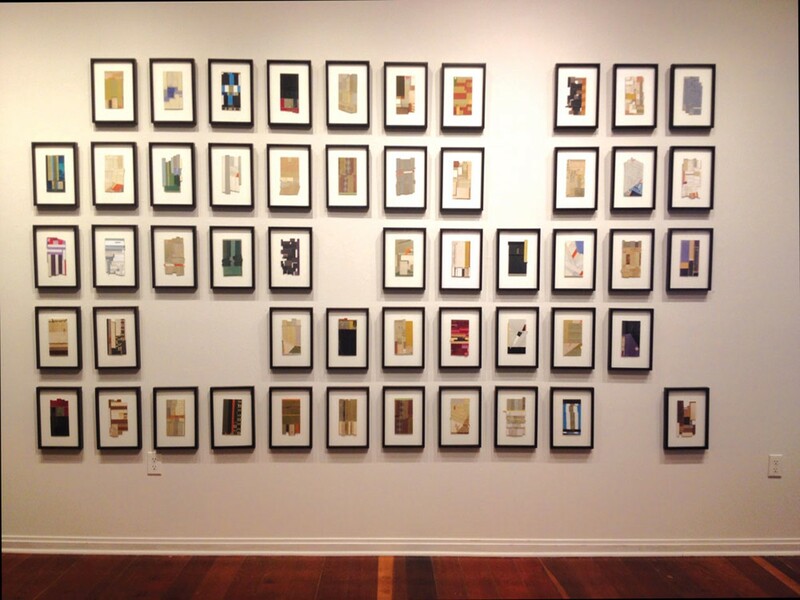 Holve's collages reproduce this dynamic, placing it inside historical brackets. The analog archive looms large in Holve's rear view mirror, making it possible for us to see things we might otherwise have missed. See Brooke Holve's Cuts Make You at the Morris Graves Museum of Art before it leaves the gallery on July 3.